Special thanks to Social Booth customer, Vince for writing this guest post on how to accept credit cards with Social Booth in a retail photo booth environment. This is not intended to be the definitive way to do this, nor is it the cheapest. 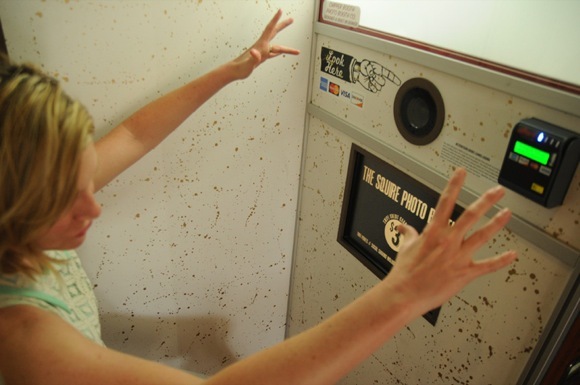 It also isn’t a complete guide to building a retail photo booth. This is the explanation of how our tiny company successfully accepts credit card payments at an unattended photo booth. Key Item #1: Software. We chose Photo Booth Solutions’ Social Booth because after a couple emails with Mike, the owner, we felt we would have good support. We also knew that SB’s social sharing options are attractive to venue owners who want to get the word out about their business. Mike also programmed a special “time left” countdown timer that you’ll see within the software (which is now standard), and programmed in a “wait for a keypress before starting photo booth sequence” for us as well. (Why these customizations are important coming up). Key Item #2: Credit card processor and hardware. This was the single most frustrating part of the process. We called several banks and processing companies. Nobody knew how to how to setup a vending machine merchant system because the whole credit processing industry is focused on Internet sales or sales from a smart device. They all wanted us to charge using the smartphone swipers or use an Internet gateway thru Internet Explorer and all had major security concerns. Nobody was helpful for a vending start-up. Enter USA Technologies. They have a full service suite designed just for vending. At it’s core is a device called the ePort. If you’ve ever bought a $4 bottle of Coke from a Las Vegas vending machine then chances are you swiped your credit card using an ePort. After a 20 minute sales call, and credit application, we immediately purchased an ePort, wiring dongle, antenna and power supply a grand total of over $500. Update: We used a “Non-traditional ePort” that runs $500 and has to be purchased by calling USA Tech. Their standard ePorts can be found elsewhere on the Internet for around $249, however these may not interface with a PC setup as easily. 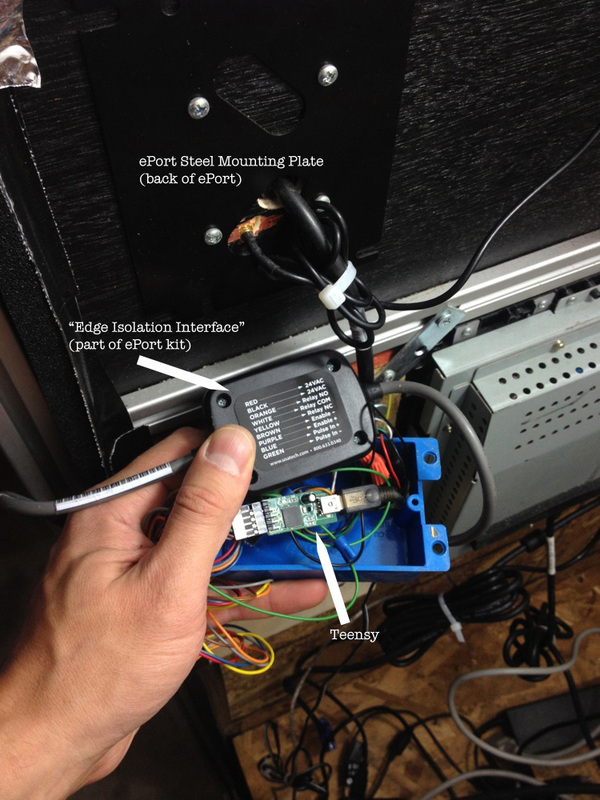 The ePort processes a credit card charge and then sends confirmation of that successful charge as an electrical pulse through two wires– much like a coin mech on an arcade machine. Key Item #3: Middleman hardware between ePort and PC running Social Booth. A device is needed to receive the ePort’s pulse and then translate it into meaningful info. We purchased an Uhid Nano to be our translator. The Uhid connects to your PC via USB and can be programmed, through a GUI, to accept a pulse and translate it into a keypress. Uhids are not cheap and come from the UK, so shipping is expensive. There are other programmable chips in the USA (Arduino, Teensy, etc) that are more economical, but their GUI is not as simple to work with as the Uhid. We mounted the ePort onto the photo booth, 48” from the ground, next to the screen inside the booth that faces the guest. We punched a 5/8” hole thru the booth, behind the ePort’s mount and fed it’s the wires inside so they would be completely concealed. Over the phone, the USA Tech people helped us solder the correct two ePort wires (of several wires) to our Uhid device, which was plugged into a USB port of the PC running Social Booth inside the photo booth. The ePort was then programmed remotely by USA Tech to charge a set $ amount per swipe. In Social Booth’s “Triggers” settings, we deactivated the touch screen until a particular key was pressed (we chose the “a” key). We programmed the Uhid to translate a pulse received from the ePort into an “a” keypress. Then, we put Social Booth in full screen mode. That’s it. The experience is this: After swiping a credit card, the ePort takes 2 seconds to charge the card, then sends a pulse to the Uhid, which translates that into an “a” keypress to Social Booth (which is sitting idle in full screen mode). Social Booth immediately kicks off the photo booth countdown. The touchscreen shows all the action but disallows any user input until the “Choose Filter” screen. After that, all Social Booth and touchscreen features work perfect … Facebook sharing, Twitter sharing, etc. After the photo booth sequence was completed, Social Booth returns to the “Ready” screen and waits for another credit card to charge. USA Tech is probably not the most economical method, but is by far the simplest that we found. Their sales people are friendly and their tech support has been immediate. We pay a monthly connection fee for our ePort, but our 2-year agreement can be cancelled anytime. Transaction fees and percentages paid to USA Tech are high, but that is the cost of simplicity. There may be more economical solutions that USA Tech offers. I want to reiterate again that we took the fastest route – not necessarily the cheapest. It takes about 7 business days for hardware to arrive with ground shipping from USA Tech. It takes 7-10 days for the Uhid to arrive from the UK. Installing a bill or token acceptor instead and avoid all the costs and fees associated with accepting credit. We felt that allowing people to use their card was much more user friendly. You can setup daily, weekly and/or monthly email reports with transactional data from the ePort. It’s a nice way to view your daily sales info. Mike at Photo Booth Solutions was also great to offer Social Booth help, but also helped us with other useful tips in building an unattended retail photo booth.